When we say “Intex air mattress” here at 3Beds, the first thought that comes to mind is one of the best price-to-quality ratios on the market. That's especially true for this bed. Dura-Beam Series is the premium line of Intex air mattresses, so we’ll take a peek under layers of sophisticated, patented technology and see what makes it tick. Let's see what changed since the last update. This Intex is currently in horn-lock with the Simply-Sleeper SS-58RF as the 3rd/4th best rated airbed out there, with a slight edge because of the bigger sample. We’ll see how it it compares to the hottest model out there. Height 22 " 19 "
Now that’s what we call a product specification that leaves nothing hidden. We stress that because we often come across products with scarce fact sheets that leave too much to guess about. With Intex, that has never beeen the case. The "secret" (if one can call it that) of the durability and comfort on this Intex is what they call Fiber Tech technology, which is basically a way to say that the internal chambers are separated by thousands of uber-strong fibers. This keeps the chambers stable, distributes the weight evenly across the sleeping surface and prolongs the "shelf-life". It also features horizontal air chambers and one additional air beam that encircles the bed for extra stability. The top is flocked (21 gauge) and waterproof and the sides and bottom are 16-gauge. It's a decent, budget solution which is pretty close to the top-rated air mattresses out there (like the SoundAsleep or the Fox Raised) and a good fit if you need a guest bed. 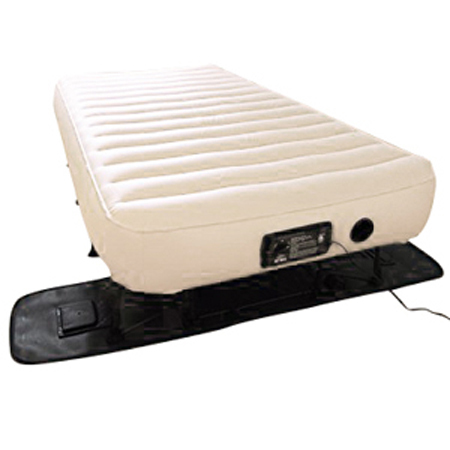 It is currently the top choice in the category of "cheap" air mattresses and in the 3rd best air mattress Overall. Apart from the stability that the fiber-tech added, it's also an elegant solution in terms of weight of the product, because unlike most models the barriers between the chambers are not solid. This is a nice touch, not so much for home use but for travel. You can't expect too much at this price point and the fact that the pump is a bit slower and noisier, is not an issue for people who are primarily looking to get the best value possible for the price of a few cups of coffee. It does NOT feature an auto-shutoff function, which means that you'll have to stay put while inflating it, choose the levels of firmness you like and turn the it off. If you think you over-inflated it you can always let some of the air out by turning the wheel on the pump to the left for a second or two. The important thing is that the rating of the pump has not changed since we first wrote about it, which means that the manufacturing practices are maintained. It fully inflates in 4 minutes, but we found that about 3:30 is just enough for the airbed to be "just-right". Some stuff changed about Intex products over the years but there are niches in the industry of inflatables that are still dominated by Intex - as you can see in our mega guide on best inflatable chairs, sofas and pumps. The price of this portable bed is just unbelievable! It’s almost on par with my AeroBed for just one fraction of the cost. Definitely worth the money! The support is out of this world! I had a hip surgery recently, and this little guy really helped me out. It gives me enough support without causing pressure points. The sleeping surface is firm alright, but there’s just enough give for my shoulders and hips. Excellent bed and high recommendation for me! Intex Dura-Beam air mattress is definitely not the best air mattress in the world, but it has a ton of features worth investigating and pointing out. The first thing we’ve already mentioned. The price. This is one of the luxurious Intex models, and it costs around 60 dollars. Talking about a bang for your buck! Everything we say about it has to be put through the prism of its price tag, which is ridiculously low. Furthermore, comfort and durability are enhanced via revolutionary Dura-Beam and Fiber-Tech technologies. These are just fancy made-up terms for stronger polyester fibers. They’ve been made much tougher compared to regular polyester used in air mattress production, so they don’t stretch over time. Because it means your inflatable bed remains firm and straight as an arrow through prolonged (ab)use. There will be no sagging or holes in the middle, which is the entire point of said technologies. Providing a better sleeping surface, enhanced stability, comfort and support. The height sits comfortably at 22 inches, which gets it as close to a regular mattress as possible. Users all around the world had pointed out the resemblance, especially when they added fitted sheets into the mix. As far as CONs are concerned, there’s the infamous duffle bag. It feels flimsy, and it’s pretty low-quality compared to the mattress itself, but it’s better to cut corners on the bag than the mattress, right? Deflation indeed takes a bit more time, as proven by both our tests and user reports. Nothing to say there, it’s simply the way it is. Plastic smell, cold feeling in cooler temperatures and such are simply universal flaws of air mattresses, so we can’t really look at them as CONs anymore. Do we recommend this Intex air mattress?? Even if we set the price aside, it’s still an excellent mattress standing on its own. The low price tag is just an added benefit, and if we have to suffer through a low-quality carry bag for it, then so be it. Be on a lookout for a follow-up article containing our test results for this update. We’ve done a couple of new and interesting tests, and we think you’ll be pleasantly surprised with the performance of this inflatable bed. So, we think we’ll keep you pretty busy until the next update on this top Intex model, one of the best value for money mattresses out there.